Despite being an Italian lottery, SuperEnalotto has developed a reputation around the world—both for having huge jackpots and for having the toughest odds of any lottery. While the game certainly offers some great gameplay mechanics and a pretty good price point considering the potential windfalls that await its jackpot winners, are its difficult odds worth your time and money? In this article we'll answer this question and in the process find out how it ranks among the world's top lotteries. 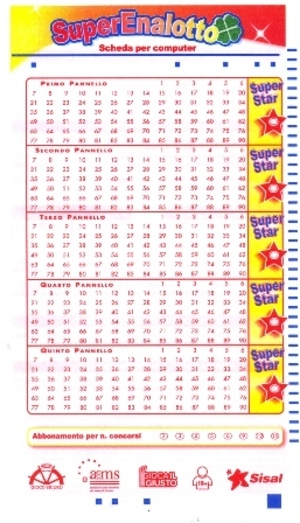 The SuperEnalotto is an Italian lottery that has been around since 1997. Evolving from one of the country’s oldest lotteries, the Enalotto, which was popular with Italian lotto players from the 1950s all the way up until 1996, SuperEnalotto is basically Enalotto 2.0. In April 1996, lottery organizers SISAL won the bid to take over its operations, at which point they modified some of the game’s mechanics and made its jackpots larger than ever. The SuperEnalotto jackpot usually starts at 2 million Euros and has reached well over 100 million Euros on multiple occasions, making it one of the biggest lotteries in not just Europe but the entire world. Thanks to the Internet, SuperEnalotto’s popularity quickly spread across Europe in the late 90s and eventually to overseas markets, including the US and Canada. SuperEnalotto tickets usually cost about €1 per try, and in order to win players must match six numbers out of a selection of 90. There is also an extra “Jolly” number that’s meant to increase the player’s chances of winning. If you manage to match only five numbers as well as the Jolly number, then you will win the second prize, which is still usually quite decent. There are 6 prize levels in the SuperEnalotto, with the highest one being a jackpot that can only be won by matching all six winning numbers. If you match five numbers and the Jolly number, you win the second prize; match five numbers and you get the third prize; and so on until you reach the sixth and lowest level, which requires you to match only two numbers. That being said, SuperEnalotto also offers players the option of adding a “SuperStar” number to their order. Though it costs a small extra fee (usually €0.50 when purchased officially within Italy), the SuperStar opens up 8 additional prize tiers that can greatly inflate prize amounts. The SuperStar numbers used to be based on the results of the National Lotto draw, but nowadays it takes place as an additional draw that is completely separate from the SuperEnalotto main draw. However, it gives players the chance to multiply their SuperEnalotto winnings by as much as 100 times. While SuperEnalotto has some of the biggest jackpots in the world, it unfortunately has the lowest odds in the world as well, so you’re really taking a chance when playing. In fact, the odds of matching all six numbers are 1 in 622,614,630, while the odds of matching five numbers plus the Jolly number are 1 in 103,769,105, which means you have a better chance of winning with the Jolly number than matching all six jackpot numbers. Compare this to the US Powerball, whose odds are “only” 1 in 292,201,338, and you’ll realize that winning the SuperEnalotto jackpot is really, really hard. Need further proof? EuroMillions' odds are 1 in 139,838,160, while the odds of winning Brazil Mega Sena are 1 in 50,063,860. That being said, it’s certainly possible, as its various winners over the years would attest. In addition, winning the minimal prize of €5 only requires matching two numbers, and the odds of doing so are quite good: 1 in 21. Therefore, for a €1 play, your chances of winning back your money and getting to try your luck again on the next SuperEnalotto draw are actually pretty good. The prize amounts vary from draw to draw depending on how much total money is available in the pool, so the estimates above are averages based on many draws that have taken place over the years. As you can see, the odds of winning anything from the top three prize tiers when adding the SuperStar numbers are pretty outrageous. However, the odds of winning a lower-tier prize are actually still pretty decent, so for the small extra fee the SuperStar is overall a worthwhile addition. 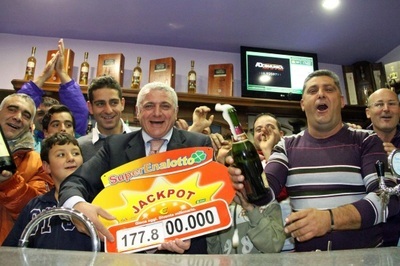 SuperEnalotto is one of very few lotteries anywhere that has three draws per week. They take place in Rome every Tuesday, Thursday, and Saturday evening at 8:00 pm Rome (CET) time. If you’re in Italy, you can purchase physical lottery tickets until the 7:30 pm (CET) deadline. Any prizes won through SuperEnalotto that exceed €500 will be taxed at a flat rate of 12%. However, if you're playing from abroad, your own country may tax your winnings as well. It's always best to look up your local tax laws to avoid any costly surprises down the road. SuperEnalotto jackpot winners have a choice of either being paid in cash as a lump sum or receiving annuity payments. However, since you'll be charged the same 12% tax rate either way, there's little reason to take the annuity option—unless, of course, you're worried about your sudden money wealth going to your head. In that case, annuity payments might offer more long-term stability. If you’re not physically in Italy and can’t visit a lottery ticket retailer in person, the best way to buy a SuperEnalotto ticket online is through one of these awesome lottery sites. Playing online through a reputable third-party lottery agent usually costs very little yet provides you with many great conveniences that traditional ticket-buying methods simply don’t provide, including having your tickets scanned and kept safe for you, being able to buy lotto tickets from anywhere and anytime, getting notified of wins automatically via email, and receiving winnings directly into player account. SuperEnalotto – Is It Worth Playing? Although the odds of winning the SuperEnalotto jackpot definitely won’t be in your favour, the odds of winning a solid secondary price and the relatively cheap price of entry make up for it. However, if you’re willing to pay a little bit more, there are other international lotteries such as US Powerball and Mega Millions that will give you not just better chances of winning but also usually offer much higher jackpots. However, that shouldn’t turn you off trying SuperEnalotto, as many people over the years have won incredible prizes through this extremely popular lottery. In the end, luck is the number one factor in winning a big jackpot in any lottery, and if you don’t try, you’ll never know. It’s really just boils down to that.